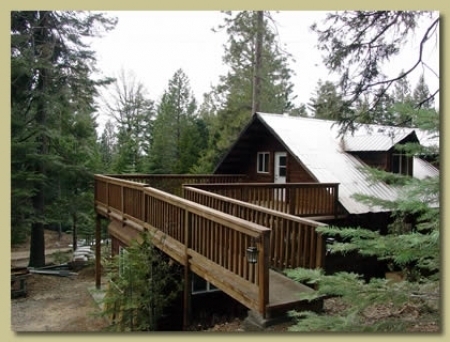 Beautiful huge cedar, oak and pine trees surround this mountain hideaway. The cottage sits atop the Bella Pavilion with spectacular views from the large deck. It’s the perfect place for your event headquarters and the bridal party’s pampering spot. The Enchanted Cottage is completely furnished with one bedroom (one queen and one double bed) and one full bathroom. It sleeps five including the double sofa sleeper, has a wood burning stove, a television with DVD and VHS player for movies only, a modern kitchen and a large deck with patio furniture and a barbecue. Just for fun, see if you can spot our three hugging bears while sitting on the deck. Enchanted Cottage – Amenities include bed and bath linens, toilet paper, TV with DVD/VCR, wood burning stove (wood provided), propane bbq (propane provided), 4 burner stove, oven, microwave, 10 cup coffee pot (basket filters), refrigerator/freezer, dishwasher, pots, pans & serving utensils, bowls & serving trays, cheese grater and more….plus table settings for 8 – dishware, glassware, silverware.